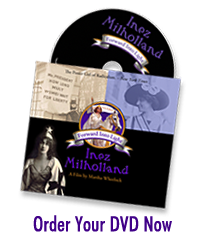 Inez Milholland was an Icon of the New Women in the early 1900’s. She was always known and publicized for her beauty and her brilliance. She was raised by socially-conscious parents and educated at Vassar where she became active in the Women’s suffrage movement and advocacy for the poor. 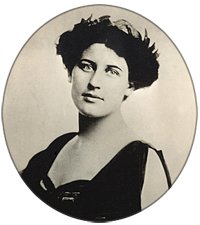 A rare woman, she earned a Law degree at NYU and promptly became involved with the labor strikes of the Women’s Garment Workers and the Triangle Shirtwaist factory struggle. Throughout her life, Inez worked and fought for the underrepresented and the oppressed. Known for her elegance, beauty and public presence, she led a big march down Fifth Avenue for New York Suffrage in 1912. On the heels of that great spectacle, Inez was drafted by Alice Paul to lead the NAWSA radical parade to disturb the inauguration of the newly elected Democrat, Woodrow Wilson. March 3, 1913. 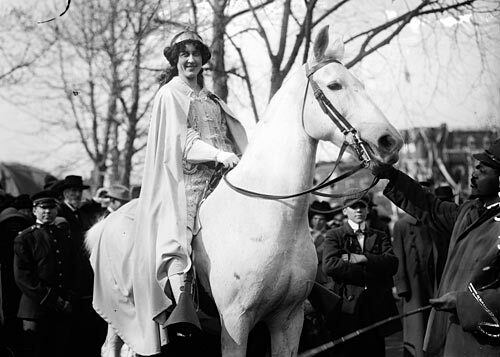 Inez led 8,000 women down Pennsylvania Avenue to the White House. 1916 was another election year for Woodrow Wilson. In his first term, he had done nothing for Women’s Suffrage. 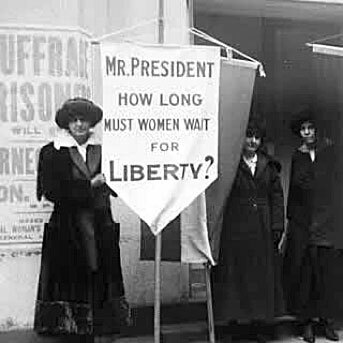 The Democratic Party and President Wilson had stalled on the Suffrage Amendment and dismissed this call for equality in national voting. With Alice Paul at the lead, the National Woman’s Party appealed for a voting blockage against the Democratic Party. 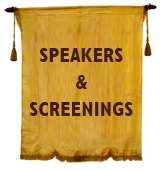 October 23, 1916, Inez spoke to 1,500 people at Blanchard Hall in Los Angeles, California. Standing at the podium, she wobbled and fell to the floor, gasping her famous last public words, “Mr. 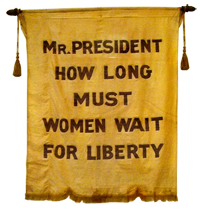 President, How Long Must Women Wait for Liberty?” It was reported that, “she fell like a wilted white rose.” She was taken to Los Angeles Good Samaritan Hospital where she spent her last month and died at the age of 30. It was front page news across the country. Suffrage Leader Dies of Anemia in Los Angeles Hospital Early Sunday. 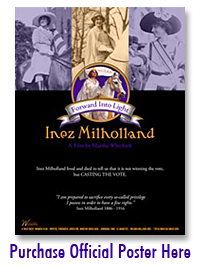 Her death became the inspiration and emotional impetus for the final push for suffrage. 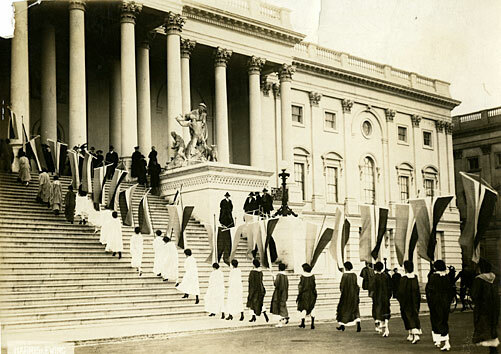 Four weeks after her death, a highly charged memorial service in the Statuary Hall in the Capitol Rotunda honored her sacrifice; her martyrdom compelled women to be the first group to picket the White House, with Inez’s plea emblazoned on their banners: “How long must women wait for Liberty.” It was this civil disobedience and direct action which pushed the issue of women’s suffrage front and center and finally into the 19th Federal Amendment. Inez gave her life as the price for women’s rights. as a race of the self-governed. She met her death preaching the solidarity of women. We accept her gift and proudly honor her triumphant death. It is only for a little while. Soon the fight will be over. Victory is in sight. It depends upon how we stand in this coming election – united or divided – whether we shall win and whether we shall deserve to win.We have no money, no elaborate organization, no one interested in our success, except anxious-hearted women all over the country who cannot come to the battle line themselves. Here and there in farm house and factory, by the fire-side, in the hospital, and school-room, wherever women are sorrowing and working and hoping, they are praying for our success. Only the hopes of women have we; and our own spirit and a mighty principle. 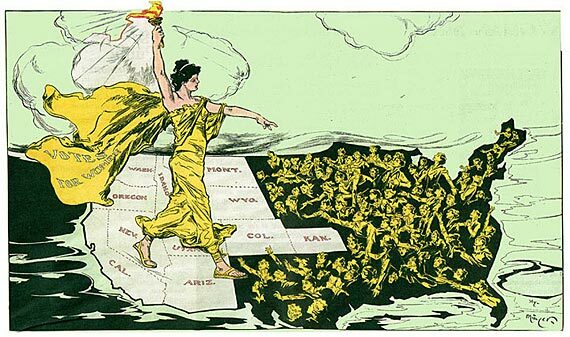 Women of these states, unite. We have only our chains to lose, and a whole nation to gain. 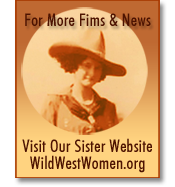 Will you join us by voting against President Wilson and the Democratic candidates for Congress?